Calroo Family Organizer is the world’s #1 FREE family organizer app that brings more clarity, happiness and calm to your daily life. Calroo helps busy parents stay organized and connected with NO ADS, MONTHLY CHARGES or SUBSCRIPTION FEES. 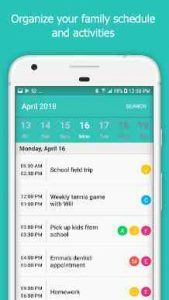 Tame the chaos of your busy family life with Calroo – an all-in-one family organizer app where you can see, plan and manage all of your family’s activities. You can organize events, assign tasks, track chores, manage shopping lists and more, all in one central place. Best of all, you can ask family members for help with a simple swipe – and get a clear confirmation that the responsibility has been successfully handed off. Calroo is completely free and also ad-free. You know exactly who is doing what, with a color-coded family calendar and to-do list that shows who is participating in each event or task. When you’re organized and in control, you free up time for fun activities like a date night with your spouse, a family movie night, or daily quality time with each of your kids. You get reminder alerts for events and tasks you need to do – so that nothing ever slips through the cracks. Once a task is complete, you mark it as done. When the task is completed, you can delete it altogether, or keep it until you need to do it again. If you’re are stuck in traffic or are busy at work, you can hand off an appointment or task to your spouse or family member with a simple swipe. You’ll get a clear confirmation of a handoff, complete with jumping kangaroos. With Calroo, you never have to stress about who’s picking up or dropping off the kids or doing other important family tasks. The handoffs and coordination are effortless and clear. Your grocery lists, shopping lists, chores checklists, to-do lists, packing lists and more are instantly shared and synced with your family members’ phones. You can create a shared to do list, a honey do list or chore checklists for the kids. You can have your to-do items in your pocket to remind yourself or send them to a family member to remind them. You can create as many lists as you want. Then just keep checking and unchecking items as you need them. Unlike other family organizer apps which use a shared family login and password, Calroo lets you decide which information to make visible to which family members. By default, your whole family will see all events and tasks on your Calroo calendar. But if you’re planning a surprise birthday party, or have a doctor’s appointment that you would rather keep private, you can choose to make it visible just to you or to event participants. Very soon, we will be adding the ability to sync your Google calendar with your Calroo calendar in real-time. If any events get added, deleted or edited on your Google calendar, you will see those changes instantly reflected on Calroo. Also coming soon is the ability to exchange private messages and photos with your family members. If you have any questions, feedback or suggestions, please contact us at support@calroo.com – we would love to hear from you. Nice app, works smoothly. Looks like the bugs that others had reported got fixed – I haven’t encountered anything major. My wife and I are using it mostly for shopping lists and tasks. We’ve tried other family apps like Cozi and Picniic but like this one better so far. It’s simpler to use, and there are no annoying ads or requests to upgrade to a paid version. Thanks for your feedback! We’re happy to offer our app completely for free, without any ads or monthly subscriptions. Don’t lose your password, there is no way to retrieve it from the app or the website. Trying to register again doesn’t work if your email address is already registered. They try to push you to register with Facebook or Google plus account which I’m not comfortable with after the Facebook scandal. Hi Jim, we improved our password reset flow – please try our latest app update, and you’ll see that you can now easily reset your password to one of your choosing. (We continue to offer sign-in with Facebook or Google as alternatives, but the majority of our customers prefer to sign up with an email/password combination). Thanks!